If your garage door is not operating the way that it should, then you will want to call our company to come out, determine what the problem is, and make any necessary repairs. Relying on our experience and expertise will ensure that you are not locked out of your garage for long and will be able to access this space easily. While some garage door repairs may seem easy, you can cause more damage to your unit and risk injury without the right tools or knowledge. Some minor problems that you may run into with your unit include track misalignment or needing a sensitivity adjustment. These problems are especially common if the tracks have debris in them or the motor in the unit is wearing out. Luckily, our technicians are always equipped to make any necessary repairs when they are visiting your home. While most issues with your unit may be minor, there are some that could be more involved. Some garage door repairs require new cables or springs to be installed. When these parts of your unit break, it can be very dangerous for anyone who enters or exits your garage. Rather than letting your door fall quickly or risking the danger of a broken spring snapping and injuring someone, call us to ensure that the problem gets fixed quickly. Other issues you may need us to fix include replacing electrical components in the unit or adjusting the strength of the cables. It doesn’t matter what your problem is or how long you have been dealing with it, we are able to take care of all problems quickly. Since we stand by our work and believe in doing a quality job, you won’t have to worry about needing another repair in the near future. When your garage door doesn’t work, it can be very frustrating. 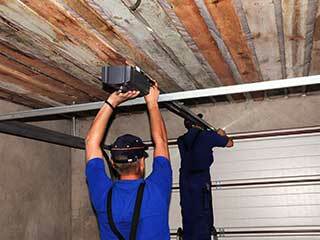 Our experts at Garage Door Repair Moreno Valley are here to help you with any issue you might be experiencing. In addition to emergency work, we also offer regular maintenance services to keep you from running into problems in the future. Just give us a call today!